Ground Control Points (GCP’s) for small and large-scale projects. The ground control points measurement procedure is one of the basic elements for the creation of modern geospatial data, determining the geometric accuracy and the quality of the final product. The ever increasing demand for large-scale and large area base maps, both vector and raster (e.g. topographic-urban planning plans, DTM, DSM, orthophotomaps and 3D city models), in combination with the today’s high demands for accuracy and radiometric quality, ask for modern and specialized photogrammetric and geodetic methods. Map, thanks to its well trained staff and state-of-the-art equipment, is one of the pioneers in this field, having completed successfully a great number of related projects. We perform detailed and thorough planning for the type, position and distribution of GCPs, based on the specified accuracy and the special characteristics of each project (area coverage in blocks or corridor mapping). We study in advance the morphology of the area (agricultural, woodland, urban, coastal) in order to achieve faster and safer access. We carefully organize and plan the activities of the field measurement teams. 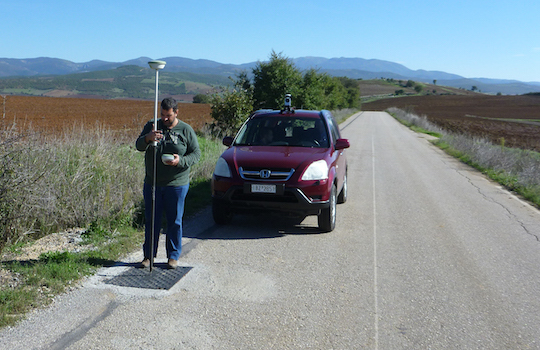 Many years of experience in methods of relative positioning (static, kinematic, RTK etc.) as well as in standard GPS/GNSS measurements (coding-description-documentation with terrestrial photos-entry in a database), ensure that the terrestrial measurements will be completed quickly and accurately. In order to quickly access and measure inaccessible areas, we own and deploy a fleet of fully equipped, vehicles (4×4 and motorcycles) and high-speed boats. We have deep knowledge in modern geodetic adjustment methods for GPS/GNSS measurements, in data transformation between different geodetic systems (WGS84, HTRS07-HEPOS, EGSA87 etc. ), in the extraction of orthometric elevations through gravitational models (EGM08) and locally defined geoid models, and in processing GPS-INS data generated from aerial mapping. Map has many years of experience and takes on terrestrial geodetic measurement of GCPs, choosing the most suitable methods, based on the specifications and special demands of each project.